Fine dust, coarse dirt and liquids: our NT 50/1 Tact Te wet and dry vacuum cleaner is truly unstoppable. 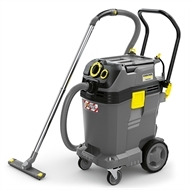 Its 50-litre bumpered container with metal castors and an oil-resistant drain hose as well as the height-adjustable push handle making it ideal for cleaning work spaces and machines in production facilities, workshops and on construction sites. It was designed for the most demanding customers in industry and construction who rely on professional machines and appreciate uninterrupted, dust-free working on a daily basis. This is ensured by the proven Tact filter cleaning system and the moisture-resistant PES flat pleated filter, among other things. An integrated power outlet with an automatic on/off switch makes working with power tools easier, while the new central rotary switch enables easy selection of suction settings, and the speed can be continuously adjusted with a separate knob. Extensive, newly developed accessories come as standard with this and can be easily stored in the integrated suction hose and accessory storage feature.